Spoiler: It isn’t working. Charles Gaba at ACA Signups had this up. In an excellent scoop by Dan Diamond and Adam Cancryn this morning, Politico reports CMS Administrator Seema Verma, the person in charge of Medicare/Medicaid and who takes great joy in trashing Medicare and Medicaid, has spent millions of dollars on partisan consulting firms to boost her image. The Trump appointee who oversees Medicare, Medicaid and Obamacare quietly directed millions of taxpayer dollars in contracts to Republican communications consultants during her tenure atop the agency and including hiring one well-connected GOP media adviser to bolster her public profile. 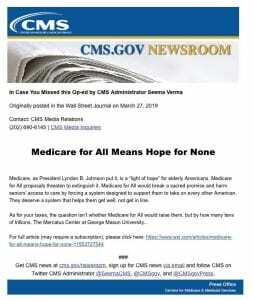 The communications subcontracts approved by CMS Administrator Seema Verma was routed through a larger federal contract and described to POLITICO by three individuals with firsthand knowledge of the agreements. The move by the CMS Administrator represents a break from precedent at the agency. 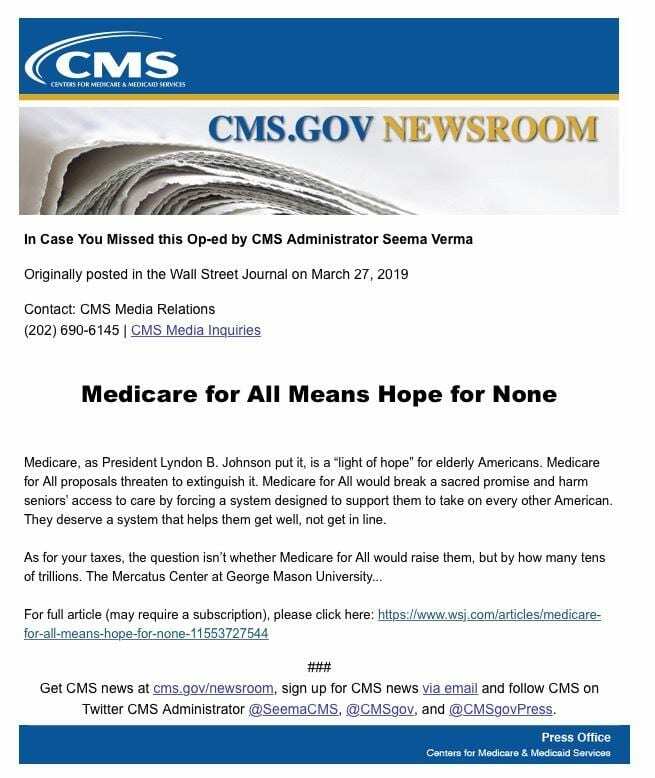 Managed by Verma’s deputies, the deals came over the objections of some CMS staffers who raised concerns about her push to use federal funds to pay GOP consultants to amplify coverage of her own work. CMS has a capable communications shop which includes about two dozen people who handle the press. The good news is that Congress is finally on the case now that the Democrats have the reins. For the record, Seema Verma is also the one who slashed the HealthCare.Gov marketing and navigator program budgets by 90% and 80% respectively over the past year and a half, allegedly in the interest of . . . “providing more efficient, targeted outreach” (via one of her press releases from last year).